I love making tarts because I can split the process into two stages, which is what I usually do. I would make the tart shell mid week after work and throw the unbaked shell into my freezer. I would sometimes even forget that I even had the shell in the freezer. Those are the days when weekend becomes a real treat. I usually try to work with smaller shells as it is so much easier to put together and I often cut the recipes into half. In that way I could whip up a variety of tart flavours from one batch of dough. I have tried a variety of doughs but I often tend to stick to two particular recipes which I find is most suited for sweet tarts and savoury tarts. This particular Pate Brisee recipe is one of them, absolutely flaky and buttery, and most suited for all sorts of savoury tarts. 1) Roll out the dough to 1/4" thickness and line a loose bottom rectangular tart pan measuring 14" x 4.5" x 1" deep. Chill for about 30 minutes. 2) Preheat oven to 190C. Prink the base of the tart shell and bake blind for about 20 minutes. Lower oven setting to 170C. Remove the beans and paper and return the tart to the oven for 10 minutes. Remove from oven and set aside. 3) Cook the asparagus in boiling salt water until just tender. Drain and refresh in cold water, and pat dry. Trim the asparagus to the width of the pan. 4) Slice the sundried tomatoes, do not use the oil. Line the tomatoes on the bottom of tart shell. 5) Mix the whole egg, egg yolks and cream together in a bowl with a whisk. Add in the mixed herb, nutmeg and season with salt and pepper. Pour two thirds of the egg mixture in the tart pan. 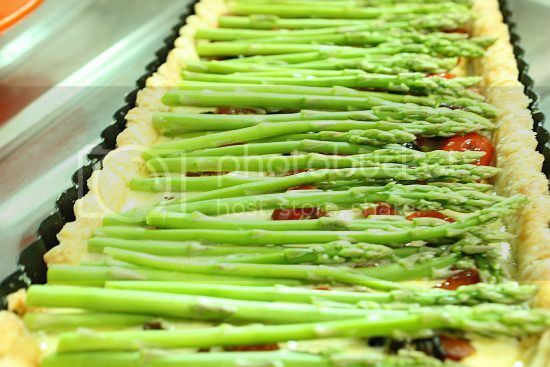 6) Lay the asparagus over the sundried tomatoes. Carefully spoon the remaining egg mixture over the asparagus. Immediately bake the tart for 30 minutes. Slide the tart onto a wire rack and leave to cool for 20 minutes before unmoulding. Never tasted one before, really curious about the taste. Both are my favourite veg. I love savoury and sweet tarts and pies! Quite unusual to use whole asparagus! Those long tart tins are so great! They look super fancy, and you get great slices of tart from them. Good idea. Beautiful! 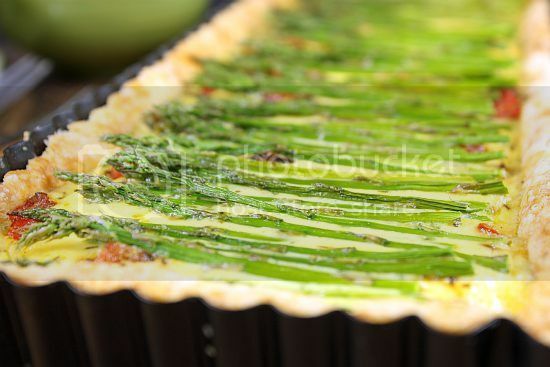 waiting for asparagus season to make this! Oh, I have that book too! It's good! Your quiche(?) looks mouthwatering! The tart looks so good! Can't wait to have the asparagus season here. 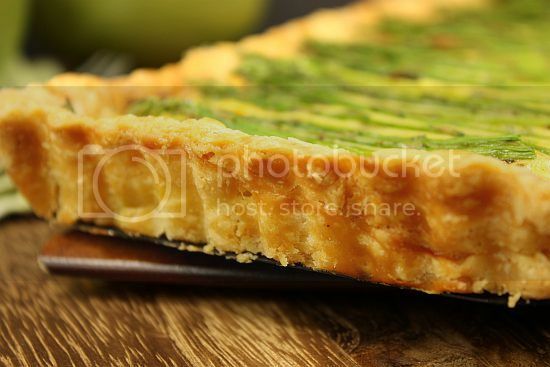 A delightful & refreshing vibrant green tarte for Spring!! MMMMMMM,...Jo!! The tarte looks pretty & ooh so ooh lalaa,...! Such a refreshing and stunning looking tart. Love the flavour. your tart looks so tasty and well-done!! Hi all, thanks for dropping by and leaving me your comments. Loved reading every single one of them. The tart is absolutely delicious. 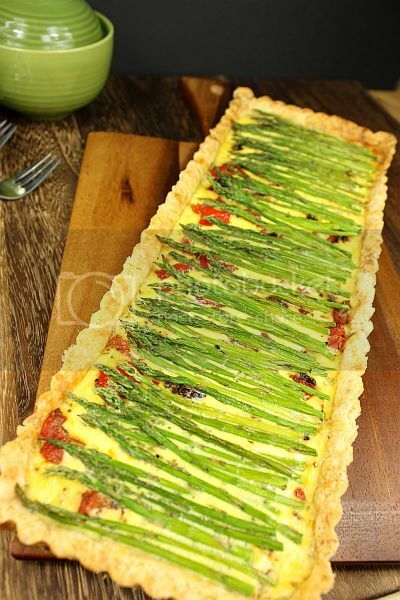 Edith, since both are your fav veggies, give this tart a go. Hi Jean, haha .. I hope I have turned you! Hi Pei-Lin, I love this book as well. One of my fav buys from Amazon. Hi Sophie, you are so cute! Hi Swee San, got the tart pan from a bake shop at Seah Street (Sun Lik). I can't remember how much it cost me (I think not more than S$12) but if you are keen I can get it from you. Can pass it to my sis-in-law who is coming down to Singapore next month. But you have to collect it from her office which is at KLCC. Send me an email if you keen.